Sitting majestically on the famous Esplanade at Woolacombe and overlooking one of the UKs most popular and beautiful beaches is the prestigious newly refurbished Parade House once owned by lady Rosalie Chichester and the adjacent sympathetic newbuild. In 1890 there were no properties along the enviable Esplanade in Woolacombe when Lady Chichester of Arlington Court had first pick of where to site her holiday home, Parade House. She chose well and the 3/4-acre development is in arguably the number one location in Woolacombe and North Devon. The development comprises 4 unique and private properties which all have stunning sea views through spacious windows creating an idyllic location for a memorable stay. 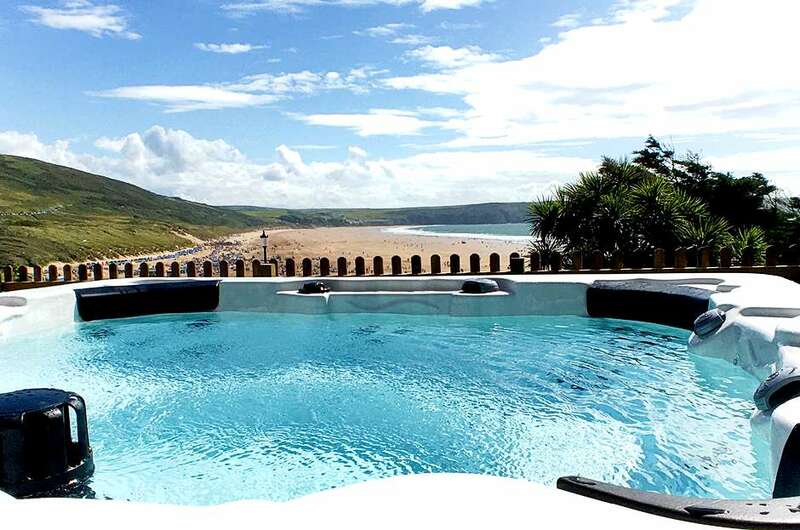 Holiday Home Hunter is proud to act as agents for this amazing property so don’t miss out on this opportunity to holiday in the newest and most sought-after accommodation and location in Woolacombe. The View comes as you might expect with stunning 180 degree views of sea. With it’s own large terrace there is a large amount of your own private space to enjoy long summer evenings in the hot tub watching the sun go down! Built and renovated in 2017, with 3 bedrooms this place can sleep 6 to 8 people comfortably if you use the sofa bed (with £70 supplement). The View combines miraculously the Victorian heritage of the whole development with cutting edge contemporary architecture. The spacious living area has floor to ceiling patio doors leading out onto the outside space. The 3 bedrooms, complete with Georgian features are very well proportioned and allow a very relaxing stay. The space works so well… Look forward to great chat whilst preparing meals at the island kitchen, or just relaxing in the large hot tub. With views to die for, The View combines cutting edge contemporary design with chic elegance, ideal for anyone wanting space and luxury in abundance. Set in a very modern open plan design the spacious kitchen and living area enables families and friends alike to enjoy each other’s company while affording plenty of space. The large space has floor to ceiling patio doors that open fully to the outside terrace area. The Stephen Graver kitchen comes complete with brand new Siemens and Bosch appliances, full size dish washer and washer dryer, fully kitted out with everything you will need. The island layout, large dining table and generous sofas use the space very well. One of the sofas is a sofa bed (please advise at booking stage if you require the sofa bed at £70 supplement). Wall mounted TV and Sonos system. There are 3 luxury bedrooms in The View. The master has a super-king size bed, the 2nd with zip n link singles or super-king size bed (please state your preference at booking stage as you complete the online booking form). The third bedroom has a double bed. The three bedrooms are at the back of the main building of the original house. Set on a delightful ground floor terrace, The View benefits from second to none outside space designed to soak up the amazing views that Woolacombe beach offers. Enjoy watching the sun disappear over the horizon whilst enjoying a soak in the luxury Four Winds Hot Tub or BBQing your latest creation. The View comes within the 3/4 acre Parade House development and visitors can benefit from the extensive grounds and walk areas. There is off road parking for up to two cars (un-allocated). A £500 security deposit will be pre-authorised and then released again after the holiday. The View at Parade is simply stunning with views, hot tub, location second to none, what are you waiting for! !